During these dark times of difficulty discourse—in which brothers tear down brothers and Sekiro purists get memed to heck and back—hit platformer Celeste stands out as a bastion of both brutality and accessibility, pushing players to the limit with devious level design but also allowing them to dictate the terms of engagement with a multifaceted assist mode. That said, people have been overlooking the greatest assist mode of all: being Kirby. 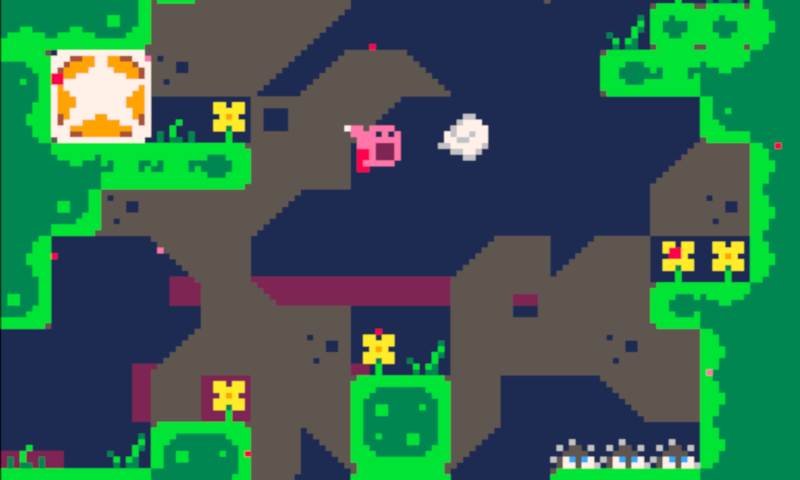 Ingeste is a free experiment from Ex.ult Videotainment that mashes up Celeste with Nintendo’s eternally joyful pink puffball, Kirby. Specifically, the project puts Kirby into the original 2015 version of Celeste, the first iteration of the game that Matt Thorson and company would eventually turn into last year’s beloved mini-masterpiece. The idea started as a joke during a podcast hosted by members of the Ex.ult team and then evolved into a new spin on Celeste’s tale of climbing a mountain as a metaphor for overcoming anxiety. Unlike Celeste’s main character, Madeline, Kirby begins his journey as a void of anxiety—and also just a bottomless void in general. As you’d expect from a game featuring Kirby, Ingeste is pretty easy. Most of the time, you just need to float upward or sideways into various spike-covered corners if you want to collect optional strawberries. Spring boxes, dream blocks, and other vestiges of Celeste’s design remain, but Kirby obliviously floats right past them to the beat of a fun, flighty cover of one of his own games’ songs. I finished the whole thing in about 20 minutes. Still, I was amused, especially after beating my head against many portions of the full version of Celeste last year. While Ingeste is kind of a joke, Ex.ult hopes that it helps further drive home Celeste’s central idea.